Why study the Sun? Since ancient times people have been curious about the Sun. Why does the Sun exist? It's as vital as water and as bright as gold. What is it made of? Why such a variety of planets? These questions could be answered by physics and astronomy. Humans try to understand the universe with these sciences and the scientific community of the Preparatory # 5 School helps in this study through the use of optical and radio telescopes. 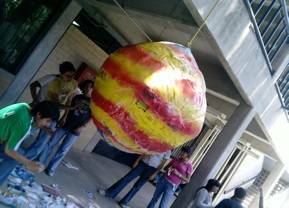 Students from high school fused this traditional Mexican art form with science to create the planets and the Sun to be shown to a lot of high school students. These planets were on display at the school in conjunction with its description and data. The image above is of Jupiter, as it is being spray-painted. For this project students consulted several books of astronomy in order to know details about each planet to present to visitors. 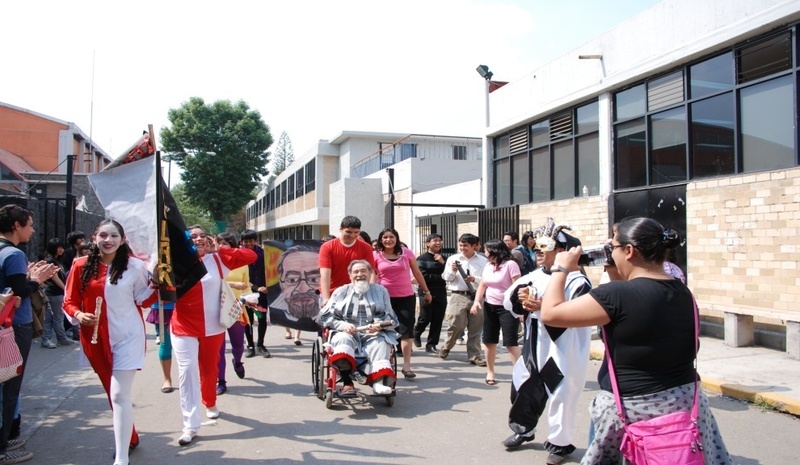 The Professor of Physics, disguised as Galileo Galilei, explained his life and work to students at the school. With the help of the "minstrels", this event, became a celebration with batons, songs and poems to invite people to listen to Galileo. Visitors received a leaflet with general information on this great character. People who followed the “minstrels” arrived at the radio observatory to see the radiotelescopes. Among the radio telescopes was the Haystack antenna which can be used to study the Sun. This parabolic antenna works at a frequency of 1420 MHz and can also be used to detect hydrogen signals from the galaxy. 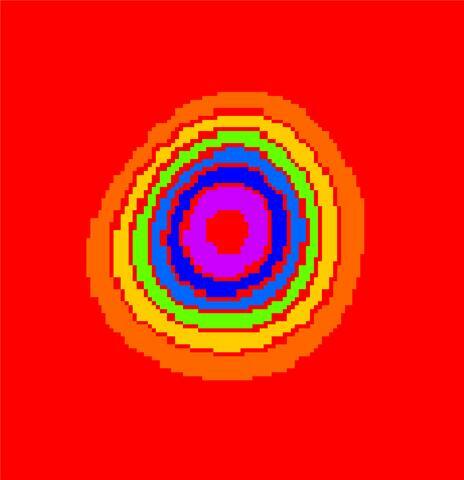 The image below shows the intensity of radio emission from the Sun. On April 2nd and 3th, we participated in an event called “100 Hours of Astronomy”, in which all the participating telescopes and radio telescopes had the same target. During this project, we used a Mead telescope, to see the amazing surface of the Moon. 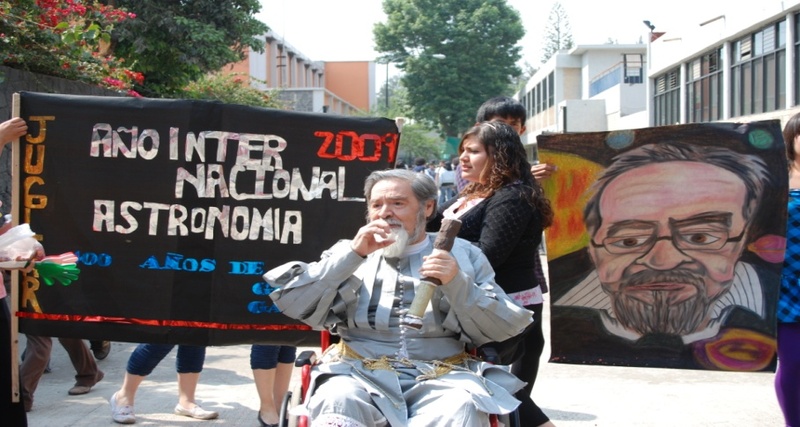 The Radio Jove Project at the College of Sciences and Humanities South Campus, University of Mexico (CCH Sur, UNAM). 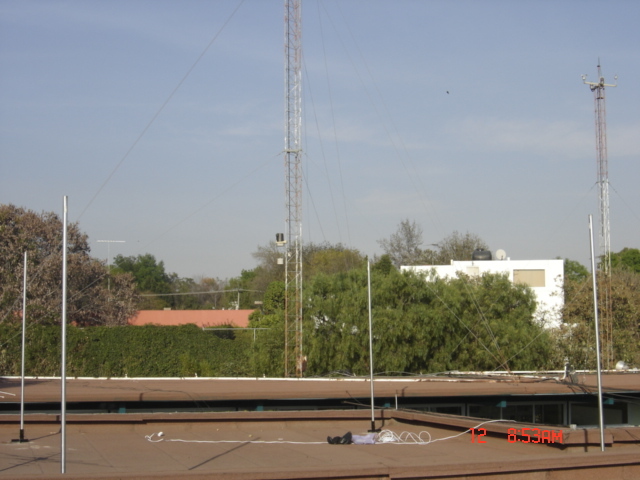 About 2 years ago, a Radio Jove Project was started by Arturo Garcia at CCH Sur. Victor Herrero joined the project a year ago, observing remotely and helping with data analysis. 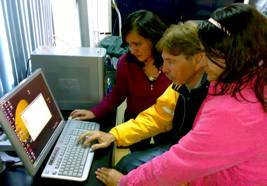 Students Sandra and Francisco recording data with the SkyPipe software. 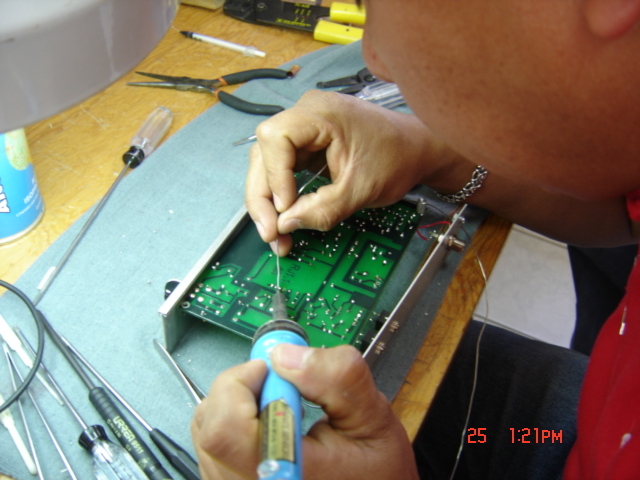 Assembling the RJ 1.1 receiver, at the Mexart Observatory Laboratories. We believe that Radio Jove is a student research project of great value in teaching Physics, Astronomy, and Science in general. The RJ instrument provides students an opportunity to learn "hands on" about the fundamentals of Electricity and Magnetism they have learned in the classroom, and their application to Electronics Engineering and Computer Science. 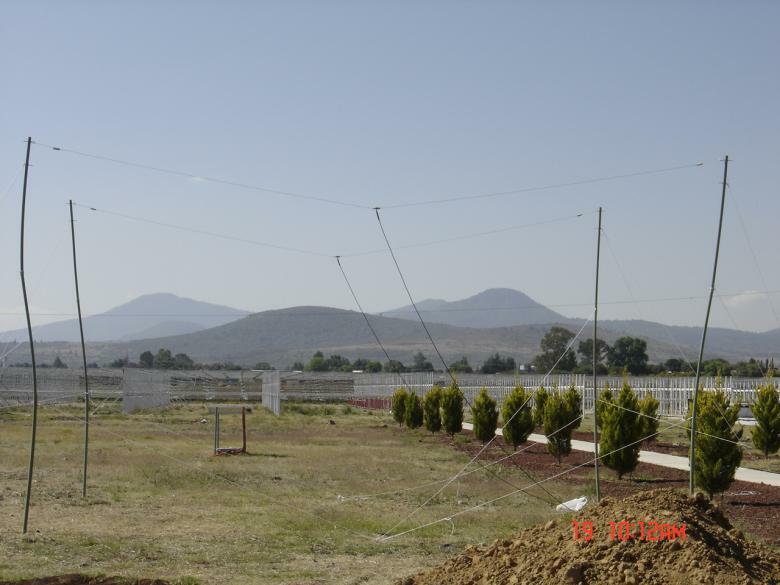 Radio Jove Dipoles next to the Mexart Radiotelescope near Morelia, Michoacan, Mexico. 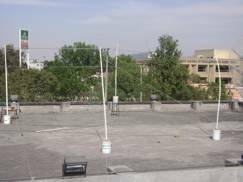 Radio Jove Phased Double Dipole, installed on the Library roof at the College of Sciences and Humanities South Campus. 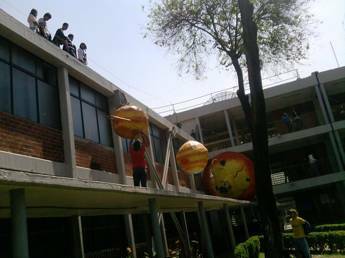 which includes the Solar Interferometer, the MEXART Interplanetary Scintillation Array, and the Teoloyucan Magnetic Observatory.Together, they provide students with a comprehensive learning experience about the influence of the Sun on the Terrestrial and Planetary environment, and Solar and Jovian decametric radio emission. 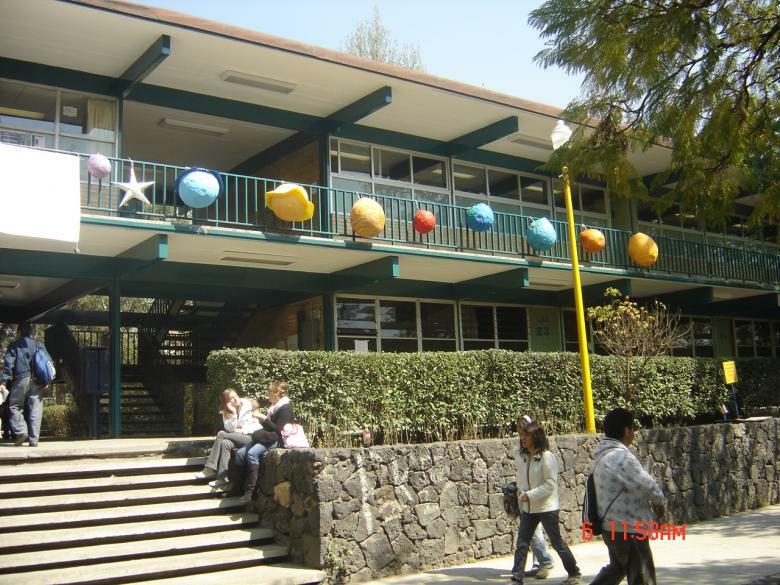 Entrance to the College of Sciences South Campus in Mexico City. 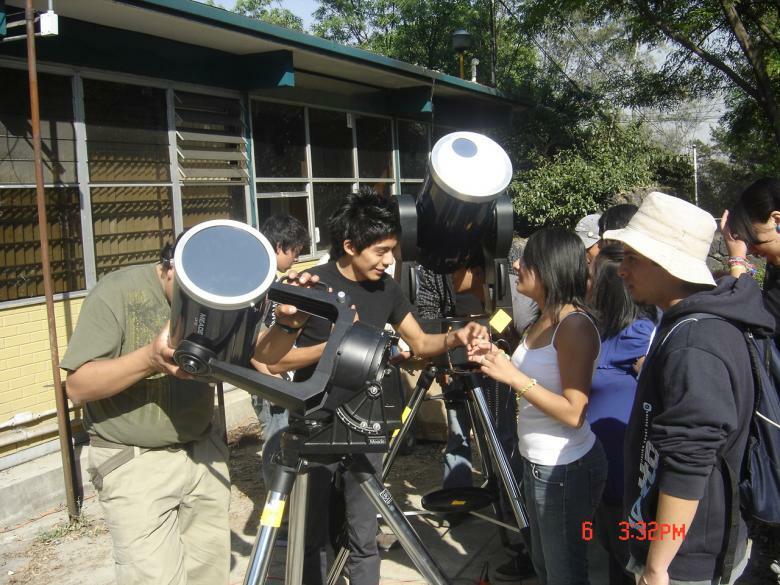 Students observing the Sun, during the February 6 2009 celebration of the International Year of Astronomy at CCH South. During the extraordinary Halloween Solar Storms of October-November 2003, Radio Jove participants Thomas Schopp and John H. Thomas observed radio emission following a powerful solar flare. There are 5 records in the Radio Jove Archive, documenting their observations. Thomas Schopp, in Saginaw Michigan, observed at frequencies of 50, 145, and 436 Mhz. John H. Thomas, in Mahtomedi Minnesota, observed at a frequency of 21 Mhz, and his charts show very well the attenuation of the galactic radio background, caused by increased ionospheric opacity following the flare (a SID, sudden ionospheric disturbance). Simultaneously, at the Australia Telescope National Facility, in Narrabri, New South Wales Australia, David Brodrick, Steven Tingay, and Mark Wieringa, observed the event using two standard Radio Jove Instruments, employed as Riometers (relative ionospheric opacity meters) at 20.1 Mhz (Journal of Geophysical Research, 110, A09S36, 2005). In their acknowledgments, the authors thank Radio Jove participant Thomas Ashcraft for the inspiration to attempt this experiment. The authors note: "The X-ray flux of this event was so high that the X-Ray Sensor (XRS) payloads on the NOAA GOES satellites, the de facto standard for quantifying flares since 1974, were saturated for 12 min." Their Radio Jove-based study became one of only 4 measurements of the precise flare magnitude and timing, with a best estimate of X40 !! at 1946 UT. Please read the June 2008 Bulletin for other RJ activities in Australia. I congratulate the Radio Jove Project for its contribution to this important scientific study. The Radio JOVE Project is continually evolving to improve hardware and software performance. In an effort to add to the quality of the data collected for research purposes, and to bring new participants into the program with the best software tools, we have decided to bundle two programs with each new kit purchase. Purchased this way you receive the software at approximately one half of its regular cost. Radio-Jupiter Pro is a program that helps you predict the best times and places in the sky to receive Jupiter noise storms. This is a highly graphical program that gives you insight into where Jupiter will appear in your local sky and which antenna configurations are best for capturing Jupiter. It allows you to customize predictions for your location and produce reports that you can use to plan your entire observing season. 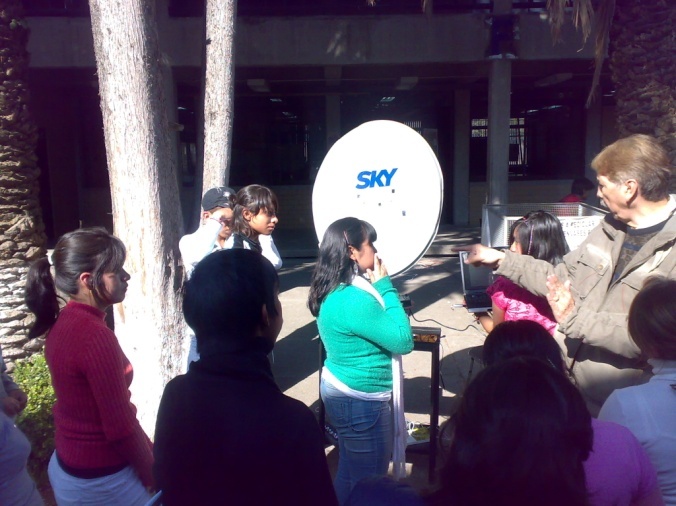 Radio-SkyPipe is our data collection program of choice. Version 2 was released several months ago and contains improvements that we think will greatly increase the scientific usefulness of our data. This software allows real-time sharing of observations over the Internet and gives you access to observers around the world. A future article will explain more of the features of Radio-SkyPipe 2. This complete kit includes the Radio JOVE Receiver Kit (RJR), Antenna Kit (RJA), RJ Reference CD (RJC), the Educational CD (RJJ), Radio-SkyPipe, and Radio-Jupiter Pro software Licenses. We hope you appreciate and enjoy these new capabilities for The Radio JOVE Project.